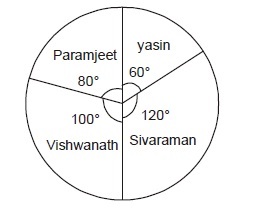 Directions (3-5): The pie chart, given here, represents the number of valid votes obtained by four students who contested election for school leadership. The total number of valid votes polled was 720. Observe the chart and answer the questions based on it. 3. What was the minimum number of votes obtained by any candidate ? 4. What was the winner ? 5. By how many votes did the winner defeat his nearest rival ?